We’re delighted to welcome author Augusta Scattergood for a visit. Augusta writes historical fiction expressly for middle grade readers. She was on the NCTE panel with authors I interviewed about that event, but was gracious enough to share some other insights about historical fiction with us in her very own interview. I’m particularly interested in what Augusta calls her “messy” approach to research when she is writing a book. When I work with students writing historical fiction, I want them to embrace Augusta’s style of research and realize that the work isn’t done once you’ve started writing the story. Welcome, Augusta! We appreciate your answering our questions so thoughtfully. First, how did you come to write history for young people? I had the dream career for someone who wants to write: librarian. My first novel, GLORY BE, takes place during Freedom Summer, 1964. I was inspired to begin that book when Ruby Bridges came to my school. She talked about how it felt to be a young girl in the south during the Civil Rights years. My students knew her as the first African American child to integrate the New Orleans schools. But her telling of the story was heartfelt and painful, and they were so intrigued and had great questions. When I went home that day, I started to think about the events in my life at the time, with many embellishments! I’d always loved reading historical fiction, still do, and now my own memories were part of the genre. After I got over that appalling idea, I realized I could set stories in a time and place that I remembered— Elvis and the Beatles, beehive hairdos, 45s. 1974 followed (THE WAY TO STAY IN DESTINY) and then the mid-1950s (MAKING FRIENDS WITH BILLY WONG). My memories weren’t as vivid but they were both interesting times. The obvious next question might be, why do you write fiction rather than non-fiction, but what our readers really want to know is this: When you write fictionalized versions of history in the form of story for readers to enter, you clearly feel a responsibility to honor the truth of the history in your work. What are your methods for discovering that truth? Research is one of my favorite things. I know, not everyone will say that, but I’ll always be a librarian at heart. Before I begin to write, I know the approximate or maybe even the exact time my story will be set. So I read a lot of oral histories online, books and magazines in libraries, and newspapers from the place I plan to set my story. I want a sense of the time and place. Not just the historical events but what the people wore, ate, read, and especially how they spoke. The big facts in my novels are easiest: When did Hank Aaron break Ruth’s baseball record, when did the Freedom Workers come to Mississippi, what songs might be playing on the radio. But it’s the details I dig deepest for. And that’s when my research methods get messy! Or maybe they just seem that way. As I write, I stop to research. Tiny details like the price of doing laundry in a coin-operated washer in 1974 or the name of a popular cookie sold in Chinese grocery stores in the 1950s send me down the Google rabbit hole. Once there, I often uncover something that changes the story, or at least enhances it. To me, the real truth in historical fiction is the story. When a reader connects to the story and discovers something she didn’t know, there’s the hook. Swimming pools actually closed rather than integrate? Chinese children weren’t allowed to go to public schools? You couldn’t sit in your comfy chair and change a TV channel? This is exactly the kind of detail that gets me (and my students, as well) most passionately involved in stories, too. What is your favorite source for beginning to research a historical topic (newspapers, museums, libraries)? So far, all three of my middle-grade novels have grown out of something in my own life. My newest, MAKING FRIENDS WITH BILLY WONG, began when I read something a Chinese American friend had written about growing up and going to my high school during the Civil Rights years in Mississippi. I went right to the source, my friend. After that, I was fortunate that our hometown’s university had recently opened a museum celebrating and documenting the Chinese immigrant experience in the south, something not that many people are aware of. My favorite place to develop an idea is a library with all its wonderful resources. But I also snoop around museums, the odder the better. I browse through high school yearbooks and moldy old newspapers. I love second-hand shops. And my own treasures? A set of saved wax lips, a skate key, photographs, old prom invitations reveal a lot about a character. Oh, I love this list, including the odd museum. Those are the best! Some of my favorite treasures from the research I've done on my current book are a diary, a Valentine card from 1912, and a receipt for the down payment on a truck. And lastly, do you have any favorite middle grade historical fiction titles to share? This list is chock full of great reads - many I've already read, but some will be stepping up on my stack. Also, the titles you shared here have inspired me to begin compiling a book list for our readers. Thank you so much for your time, Augusta! I'll be sure to share your thoughts with students when we work on the next collaborative novel. You can find out more about Augusta and her books by visiting her website. Check out this wonderful short video from Tonya Bolden on helping children write about history. I caught up with Caroline Starr Rose after conducting this interview, and she was gracious enough to share her responses here as well. I’m very grateful that my role models for writing historical fiction have been so generous with their time. The original interview appears after Caroline's responses. Gather Here: First, how did you come to write history for young people? Caroline Starr Rose: I always enjoyed history in school, but never felt particularly smart when it came to “knowing” history. There was just too much to master. Historical fiction was my true entry point into understanding the past. It went deeper and wider than a handful of paragraphs in a textbook and made history come alive for me. I know how easy it is to get wrapped up in our own lives, to not see beyond our attitudes and experiences and modern-day sensibilities — I know because I often find myself gravitating to this familiar place. Historical fiction beckons us to step outside ourselves and enter worlds completely removed from our own. It asks us to be bigger than ourselves. I love that. It’s what I want to offer young readers. GH: The obvious next question might be, why do you write fiction rather than non-fiction, but what our readers really want to know is this: When you write fictionalized versions of history in the form of story for readers to enter, you clearly feel a responsibility to honor the truth of the history in your work. What are your methods for discovering that truth? CSR: Lots of research, with special attention paid to personal first-hand accounts such as letters and journals, if available. I want to get the “feel” of a time and place, and that’s most evident in the way people communicated privately. A book called Read This Only to Yourself: The Private Writing of Midwestern Women transformed my verse novel, May B. My first attempts began in prose, but the story in my mind was nothing like the story on the page. I returned Read This and rediscovered the spare, careful way these women conversed with loved ones. I really felt like I’d found some magical key. Honoring the voices of these women would give me the most honest, close-to-the-bone access to my character and her world. It’s what led me to writing the book in verse. GH: You organized but were unable to appear on a panel at the conference for the National Council of Teachers of English. The description of this panel led me to ask for an interview. Can you please tell us how the idea for this panel came about? CSR: Unfortunately, I wasn’t able to attend NCTE in the end, but I was a part of the beginning stages in developing our topic. Someday! As I mentioned above, one of the key aspects of historical fiction in my mind is its ability to turn our gaze from inward to outward. Through reading historical fiction, we meet people vastly different from ourselves. We become involved in these real and imaginary lives, come to understand these characters. That leads to empathy. That outward gaze eventually turns inward again, and hopefully for the better. I trust that it becomes impossible for a reader not to be challenged by what they encounter on the page. Here’s a simple example. In both my novels Blue Birds and Jasper and the Riddle of Riley’s Mine, my characters comment on what they consider to be luxuries. For Alis, it’s London’s fountains and fish stalls. For Jasper, it’s three square meals and the possibility of having a whole day off from physical labor. What a contrast to our own lives! Historical fiction asks us to respond to what we find there by seeing our lives in a different light and giving a broader view to the lives of others. What could be more important? GH: The reason we created Gather Here: History for Young People ties directly with one of our state’s educational standards for its students. That is to put historical events and the lives of historical figures into context for young people in order that they can better understand their own part in becoming citizens of the world. How does your work reflect this idea? CSR: I haven’t to this point focused much on real historical figures. You’ll find them in Blue Birds and Jasper, but just in minor roles. I’m much more interested in the lives of ordinary people because that’s what most of us are: regular folks trying to make our way in the world. Thanks so much, Caroline, for adding your voice to this conversation. I was lucky enough to interview Kirby Larson and Janet Fox about their work and their appearance on a panel at the recent National Council of Teachers of English conference. The title of this panel, called "We See Their Faces: How Historical Fiction Advocates for Empathy, Diversity, and Social Change" inspired me to reach out and ask about this concept so that we could share it here on the blog. To quote the Program Notes from the conference, "Empathy toward others and advocacy for diversity is more important than ever in schools. This teacher/author panel examines historical fiction characters as role models for today’s children and provides participants with ways to respond to injustice and obstacles through themed units, character studies, and social action projects." We really appreciate having both Kirby and Janet weigh in on these thoughts. Kirby Larson: I really disliked history as a kid/young adult. But that’s because I didn’t realize history wasn’t about dates and wars and generals — it was about real people! And that revelation came to me when my beloved grandmother told me a story about her mother that I’d never heard before. My grandma was battling Alzheimer’s disease at the time, so I wasn’t sure I could trust her information. But it was one topic that she was happy to talk about each time we were together, even when she forgot who I was and how we were connected. A little digging confirmed what she’d told me: my great-grandmother proved up on an eastern Montana homestead all by herself as a young woman. She built a claim shack, set fence, plowed fields, carried water — all while battling wicked weather, wild animals and deprivations. I couldn’t imagine my tiny great-grandmother accomplishing such huge feats. And then I learned that there had been many, many women homesteaders like her. I knew I’d found a story I could tell! And that led to my first historical novel, Hattie Big Sky, which won a Newbery Honor. Janet Fox: It was somewhat accidental. My first three novels are young adult historical romances. When I set about writing the first, FAITHFUL, I didn't know it would be historical; I was responding personally to the death of my mother. But when I decided to set the story in Yellowstone National Park, it immediately suggested that I take the long view, which meant setting it in the past. Once I began writing historical fiction, I was completely hooked. My most recent novel, THE CHARMED CHILDREN OF ROOKSKILL CASTLE, is a fantastical fairy tale set in Scotland during World War 2. Why that time period? Because the novel evokes the NARNIA tales that I loved as a kid, and those were set during World War 2. KL: I chuckled to myself as I read this question. It might be easier to tell you what I don’t do in discovering historical truths! I generally start with books on a topic of interest, mining the bibliographies for my next steps. My goal is always to get myself to primary sources. With Dash, I was able to interview people who had themselves been incarcerated during WWII in places like Minidoka. For Hattie’s story, too much time had passed to find people who had homesteaded during the First World War, so I did the next best thing to interviewing: I read diaries and letters and reminiscences. I study old recipes, newspapers, maps; I visit museums and archives. I’ve even been known to call up complete strangers to ask them burning questions such as how was mail delivered to ships in the Pacific during WWII, what kind of camera a newspaper photographer would’ve used in 1919 or whether a certain postcard would’ve been available to purchase during the time my story is taking place. No stone left unturned, as they say! JF: I love that question. Research is the obvious answer. But it's more than that. Truth is in the heart of a character. And then truth emerges through the voice of that character. So while I endeavor to get my facts absolutely right, since I also incorporate fantasy (in THE CHARMED CHILDREN) I need to pay close attention to getting the character right and the voice of that character right. The story then emerges from the character and not from a static set of well-documented details - which may not even appear in the story. I was so gratified when one reviewer wrote that he didn't realize that I was American until after he'd read the book and then looked at my bio. GH: You appeared on a panel at the conference for the National Council of Teachers of English. As I mentioned above, the description of this panel led me to ask you for an interview. Can you please tell us how the idea came about? KL: The lovely and kind Caroline Starr Rose (author of May B, and Blue Birds) proposed the topic of how historical fiction can engender empathy and social action in young readers. And then, sadly, she was not able to participate! But from that seed blossomed a powerful panel. Participants included Janet Fox, Linda Sue Park, Rita Williams Garcia and me. There was such a great discussion and I was too caught up in it to take notes. But I do remember Rita’s observation: “History lets us know how good and bad we can be." JF: A group of women writers have gathered in a closed Facebook group to support one another, and we cooperatively gathered interest in submitting proposals. Ironically, the person who suggested that panel on encouraging empathy in students, Caroline Starr Rose, and who put the initial small group together, ended up unable to attend the conference. While we were putting ideas together we came across Linda Sue Park's extraordinary TEDx talk on how A LONG WALK TO WATER inspired such broad outreach and activism, so we invited her and then Rita Williams Garcia to join the panel. KL: Playing off on Rita’s words above, it seems to me that we can’t really be our best selves in today’s world without understanding our past. One small example: like many other people, I used to say that American women gained the right to vote in 1920. But the truth is that some women got the right to vote in 1920. Native American women received that right in 1924; Japanese American women, in 1952; and many African American women were denied that basic privilege until the passage of the Voting Rights Act in 1965. (Read more here: http://www.kirbylarson.com/throwback-thursday-voting_rights/) The truth is often complex, complicated and sometimes plain old crummy. Knowing it, however, can only help us move forward as a people and as individuals. JF: I like to hope that everything I write does one thing first: engage a young person in reading about the experiences of another. Then several things happen. First the reader sees herself reflected in that character - and she can then process her own experiences more clearly. Then the reader comes to understand the perspective of the other - and she can then become sympathetic. And finally my hope is that the reader experiences empathy, the fullest connection with another (in this case fictional, with a touch of real) person. In my view, we aren't citizens of the world until we connect with other people in that fullest fashion, with empathy, knowledge, and understanding. Thanks so much to the two of you for sharing your thoughts about what you write and why it’s important. Central Idea: By studying their family heritage, people can learn about their history, traditions, and customs. I've got a 1914 cookbook, a marriage license application notice, a diary from 1914-15, a photograph of an individual, an old map of Washington DC, a receipt for purchase of a Ford pickup (1928), and a report card from 1910 to share with 3rd grade students today. These artifacts serve as illustrations of how family story can change the narrative of an individual's life, and a glimpse into the past as we dig into work about Ancestors. Now I'd better make a good lunch! We've got lots to explore today. A Line a Day diary (1914-1936), a purchase plan for a Ford pickup ($5 down payment), a map of Washington DC circa 1916, a college photo of Kate, and a report card from when she was about the age of the students I visited with. Here are some of the items we worked with when I visited 3rd grade. Diaries hold an endless fascination with all these guys, and I heard many stories about reading siblings' private thoughts. Yikes! Mostly, though, we talked about family stories, our responsibility to look for the truth if we can, and places to find primary source materials to confirm that truth. Their examples of where to find primary sources: archaeology, museums, libraries, and families. Responsibility and perspective are tough concepts for 3rd graders to wrap their heads around in this context, and we did great work exploring these ideas. It was also fun to find out that University of Washington beat Washington State 40-0 in 1936 by reading Kate Stein's diary. Gather Here: History for Young People seeks submission of pitches for articles and short stories. Our collection serves educators teaching Pacific Northwest regional history to students ages 8-12. Current needs are for articles covering County history, lesser-known events in the Pacific Northwest, and work by those whose perspectives challenge widely held assumptions about the significance of historical events in our area. Historical time period, event, group, or person covered, and reasons for your interest in the topic. Expected length of your piece. Prior work in the area of regional history, if applicable. Works of nonfiction can range from 500 to 1000 words. Photos with documented permissions are always welcome. Works of fiction no longer than 2000 words are most appropriate, but we are open to a variety of formats and styles. Payment depending upon length and format. Address inquiries to Valerie Stein at books@homeostasispress.com. Before submitting, please visit our page, look at our content, and see if our project is a fit for you. We published a post in the spring about a teacher whose students wrote collaborative novels inspired by their study about the Everett Massacre. The first of those novels is nearly ready to post here on the site, and we are very excited to share. We apologize for not getting the full schedule posted earlier, but we wanted to let you know about some event surrounding the commemoration of the Centennial of the Everett Massacre. We're planning to attend some of these events, and we'd love to know if you might be able to make it, too. Here is the link to the full listing of events from tomorrow onward. There are film screenings, interviews and art presentations commemorating the events surrounding the massacre. Saturday's presentationfrom 1-4 includes a talk by artist Deb Fox, the creator of The Everett Massacre: A Graphic Novel. Also featured is Fred Bird of the Labor Press Project at the University of Washington. Sunday's documentary film, Cuts, also airing at 1 p.m., documents the lives of shingle weavers, and is followed by the reflections of a real-life shingle sawyer. The Main Branch of the Everett Library is located at 2702 Hoyt, Everett, WA 98201. Other events are held at the Evergreen Branch of the Everett Library, located at 9512 Evergreen Way, Everett, WA 98204. We've added two new resources to our Resource page. There you can check out offerings like the Speakers' Bureau listings from the Puget Sound Navy Museum, or Story Programs from the Nordic Heritage Museum. Both of these community resources have been very helpful in some recent research we've been doing about maritime history in the Puget Sound. We're gathering additional materials useful for researching Native American history, which we will be adding soon. Remember, you can always ask us to add resources you use and wish to share by using our Contact page to reach out to us. Gather Here: History for Young People would like to extend our heartiest congratulations to Mark Holtzen on the release of another great book about a much-loved aspect of the history of our area. A Ticket to the Pennant: A Tale of Baseball in Seattle, is available today! We've seen it, and we're very excited that it's out in the world now. Are you a baseball fan? We hope you’ve read Mark’s articles about the history of baseball in Seattle here on the site, but even more, we hope you’ll share his latest book with other fans of the game. For a list of featured bookstores and information about ordering a signed copy, along with a list of Mark’s upcoming appearances, hop on over to Mark's website. While working on bringing some more visual content to the site, we've been digging around in maps archives. We'll be adding some map and image resources to our Resource page soon, but for now, you can check out the wonderful Public Domain maps in the Washington State University Digital Collections. Of course our favorites are the Early Washington maps, but there are many images to explore here, and the search feature is easy to use, with good relevance. Some patience might be needed for younger students following through the albums, but with assistance they should be able to find and easily cite materials. It’s great to see this topic covered in local news sources. We found an article about it in our own morning paper recently, but a search shows that the same content was also run in other papers around the state, like this one. Since Time Immemorial was developed as part of a new law requiring that Native American culture is taught in Washington State public schools. You can find links to IndianEd.org teaching materials, along with some wonderful informational videos, on our Resources page. We had the opportunity to meet with Michael Vendiola, and look forward to participating in the curriculum training in the near future. Though this link accesses last year’s calendars, teachers interested in taking the training can can contact the OSPI Office of Native Education for information through the inks on this page. This month we've added two new entries to our Resources page. Both The Wing Luke Museum of the Asian Pacific American Experience and El Centro de la Raza work to inform and serve their communities while preserving their histories in unique ways. The museum won the Institute for Museum and Library Services (IMLS) National Award for Museum Service in 1995 as a result of their unique work in involving the community in building exhibitions which would serve to educate and enlighten all. In addition to Family Day and Teen programs, Wing Luke hosts Tateuchi Story Theater each month for all ages. There is so much for educators at the museum as well. You can follow the links on the resource page to explore further. El Centro de la Raza's many events seek not only to strengthen the Latino community, but to share cultural gifts with all who seek to learn. They provide a wide variety of programs for youth, including the Luis Alfonso Velásquez After School Program, offering tutoring, mentoring, and cultural and social justice curriculum. We’re honored to be given the opportunity to share images of the murals gracing the walls of the center, along with their historical background and symbolism here. We’ll be adding this piece to our resources soon. Mark Holtzen, one of our project's founders, will be part of December's History Cafe at MOHAI on December 17 at 6:30 p.m. This looks like a great event for Pacific Northwest history buffs. Say hi to Mark if you get to attend! In our History Mystery post, I shared photos and thoughts about a boat I saw in our local boatyard, then posed questions about where our readers might look for answers about the boat's history online, as an exercise in research. My own next step was to head to the local marina office which manages the yard where the boat was stored to look for answers. Before I got a chance, an article appeared in the Port of Everett’s marina newsletter, and our mystery was solved. The Pt. Defiance is a 60 foot wooden-hulled purse seiner, built 100 years ago. It sank here at the Port of Everett in October, 2014. Following the story further, I found connection to our very first blog post, History in Your Neighborhood, highlighting the Everett waterfront's history. Visit the Historic Everett waterfront site for more information about the vibrant lumber, commercial fishing, and boatbuilding history of Everett, Washington, including the history of the Pt. Defiance and her captains, Vince and Butch Barcott. You can also find an overview and timeline of each of these industries on the site. We learned so much from reading the signage here! These folks worked long hours. I tried to imagine working inside this machine for so many hours a day. The dredging left behind these huge gravel mounds with the stream winding between them. The Bayhorse Mine east of Custer, Idaho. Active until around the time the dredge was brought up the Yankee Fork of the Salmon River. This building actually housed the machinery where the ore was extracted for the rock that was excavated from the mines. This machinery, on a fabric pulley, would have lifted ore into the hoppers for grinding. It was one of several artifacts ranged around the area at Bayhorse. One of the new resources we recently added to our page is the Klondike Gold Rush National Historical Park. Reading about the history of gold fever in Alaska and Seattle made me think back to our summer trip through Oregon to Idaho. We encountered other evidence of gold mining activities in the Pacific Northwest. The area we visited is about 750 miles from Seattle, so you won’t likely make it in a weekend if you live in the Puget Sound, but plan a trip for summer (these visitor centers are closed in winter). We couldn't stop there, but we passed Sumpter, Oregon, home of the Sumpter Valley Dredge, on our way to the Yankee Fork of the Salmon River. In Idaho, we visited the Yankee Fork Dredge, still sitting where it was abandoned in 1954. We learned about the salmon restoration project taking place there, after dredging destroyed the stream bed for spawning so long ago. We learned how little gold was actually mined there. We also visited two ghost towns in the area, both established to hunt for gold in the early days of the Gold Rush, established before the dredge came to town. Here are the questions that came to mind as we wandered the dusty hills, looking at the remains of communities which were so busy at one time. What was it like to live in these remote places in the late 1800s abd early to mid-1900s, brought here simply to hunt for a resource? What can happen to the environment in situations like these, where only a few people are responsible for deciding how to use the land? Is your life today affected by those decisions made long ago? Why do you think this? The Sumpter Dredge was successful in getting a large amount of gold out of the ground. The Yankee Fork Dredge was not. Interesting to consider when we think about that cry: There's gold in them thar hills! Last Monday was a national holiday. Banks and post offices were closed, and some schools. Until recently, the reason for the day off for some was only called Columbus Day. Last year, the city of Seattle changed the name of this holiday to Indigenous Peoples’ Day. Why do you think this change was made in Washington as well as California and Minnesota? Do you think other states will make this change in the future? Here is a link to a news story for young people about Indigenous Peoples’ Day. It might help you form some opinions or ask more questions. We'd love to hear what you think! 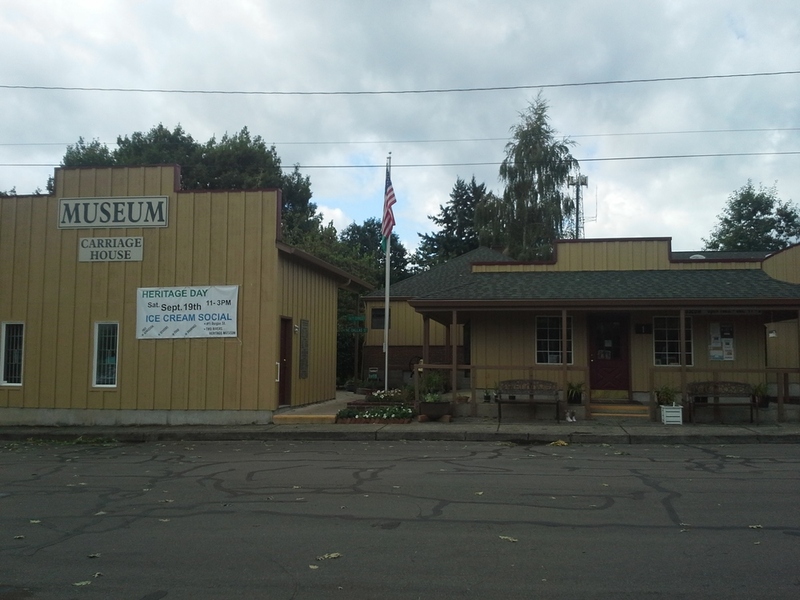 As you travel up the Columbia River from Portland, Oregon along Highway 14, there is some hidden history in Washougal, Washington. Two Rivers Heritage Museum is a nice historical stop here in town, with artifacts to puzzle over and to explore. Walk a street over from there and tour the Pendleton Woolen Mill, then get ready for a real walk back in time as you leave the Mill Store steps and turn left. 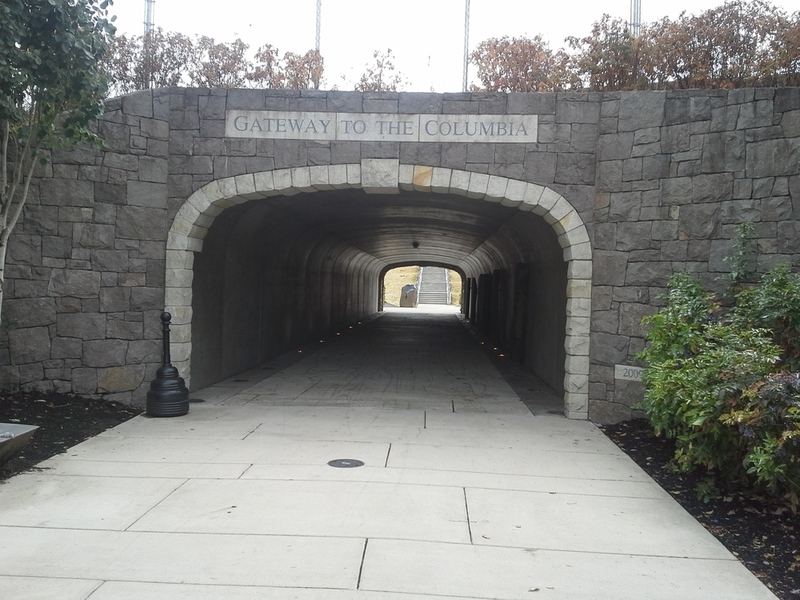 Here is the pedestrian tunnel that leads to the Columbia River. Inside is the result of work by local teens and many others on The Petroglyph Project. Washougal’s Captain William Clark Park is a walkway along the Columbia featuring many interpretive signs where you can learn more about the indigenous residents of the area, the history of Lewis and Clark, and the native plants and animals you might encounter as you travel the trail. Do you have time to walk a little farther? Cottonwood Beach, part of this trail, is well worth the half mile or so walk farther up the river, though I didn’t have time this day to visit the park, with its great signs, structures and sculptures telling stories of the river and the surrounding communities. Is there hidden history in your town? We’d love to hear about it! We've added new Resources this month. Check them out! As we build this site for you, we plan to include other types of resources, like links to historical societies, library resource pages, history blogs, and book lists you might use to research a topic or to deliver curriculum in your classroom. It was fun poking through the pages of The Burke Museum to find resources you could use with students. A visit from the BurkeMobile? Wow! A Story Trunk from The Northwest African American Museum in Seattle would be a great addition to your curriculum, too. There are many opportunities to explore new ways of connecting students to history, and on the Resources page, we've worked to direct you to content that is relevant to your needs. If you have favorite resources, feel free to let us know by sharing through our comments page, and remember, you can join our mailing list there, too. President Barack Obama recently used his Executive Powers approve a change to the name of an Alaskan mountain from Mt. McKinley back to the name Alaskans have long called it: Denali. share different views of this issue. Can you identify the different points of view expressed from different sources? Are all the facts in these articles expressed the same way? What else beside the name of a mountain do these articles make you wonder about? An article from The Seattle Times shows that the name change is causing people in our own State of Washington to think about name changes for geographical landforms, too. Last week, when I was searching for information about the boat, Point Defiance, from Everett, Washington, I found a listing of maritime museums called Smith's Master Index to Maritime Museum websites. I linked to the Washington page in my last post, and again here. It shows museums all over the United States. That list is so long that I knew it might take a long time to do my boat research that way, but I was curious anyway, and started poking around to see what things might be interesting for kids. I found the Kids’ Zone on the Edmonds-South Snohomish County Historical Society and Museum site. There are just a few items there, but they look like fun. You can download several full-color activities if you’re interested in paper dolls or a couple of games if you like boats (I happen to be interested in both). There is also a “Write Your Own History” page, with some suggestions about writing about your own history in addition to gathering your own oral histories from grownups. I’ll let you know if I find any other interesting tidbits in these museum pages. In the meantime, you can look around for yourself You never know what you might find!